Last year, most of southern Colorado was burning in the early summer. By the time I got out to fish most of the fire was out but much of the area was closed due to still smoldering forests and the obvious danger associated with such a recent burn. Of course, the hardest part is the uncertainty---How is the denuded watershed going to respond? What if there is too much snow or not enough? Will the invertebrate community survive and thus the fish? What about the people and the towns you’ve grown to love? How will they respond? This has been on my mind throughout the winter and spring. These early reports made it all that much harder for me to wait until I could schedule a trip but I finally made arrangements and headed out to the Big River country right after the Fourth of July. This is about 3 weeks earlier than I can usually make things work but probably too late to get in on the early summer aquatic insect hatches that the Big River is known for. I was wrong---the hatches were so good they were still in progress in the upper part of the river--later than usual. My wife had not been to this part of Colorado for almost three years. This had to be remedied. This trip was mostly for her but she understood that I would have to fish. She attended the theater and I went fishing---good plan. Since Carol would be in town without transportation, I needed to stay close or at least have a pretty defined fishing itinerary. 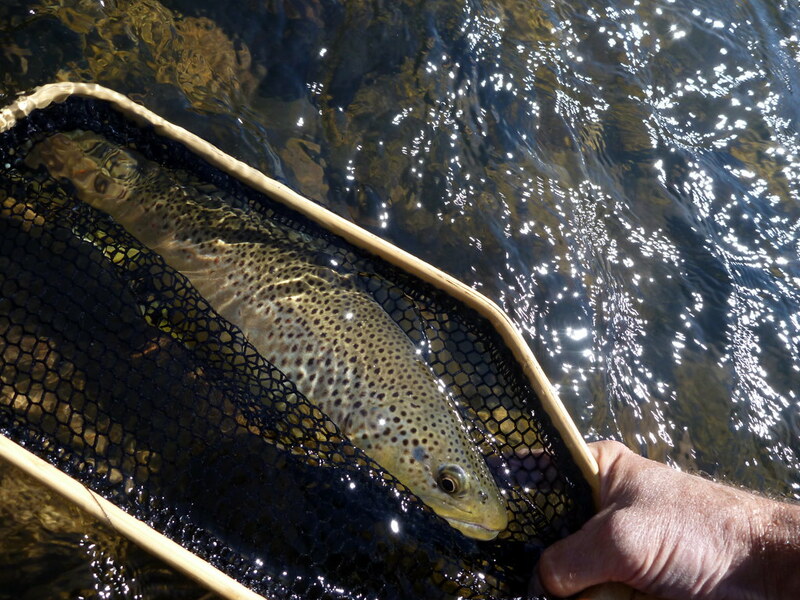 The first day, based on flyshop intel, I decided to fish upstream from town about 7 miles. I got to the river a little on the early side. 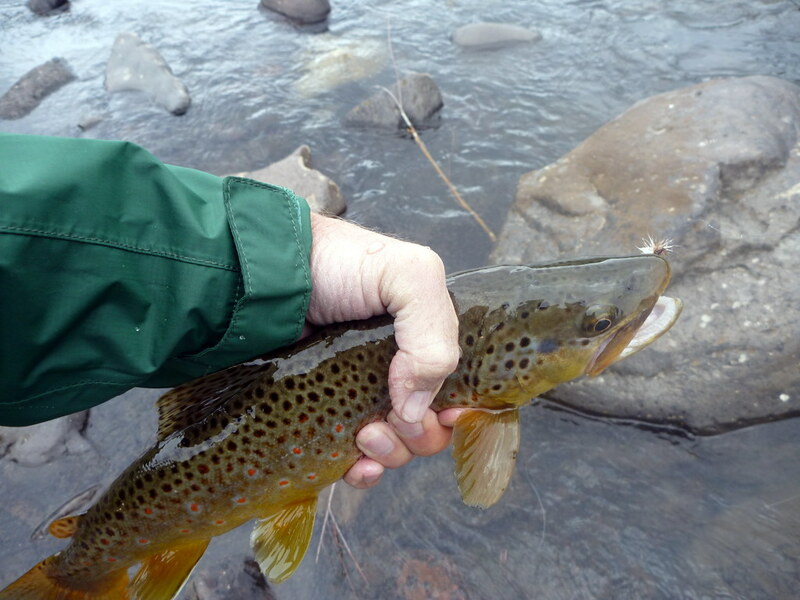 The weather was cool, in the lower 50’s and so was the water temperature making my wet wading a bit on the chilly side. Not much was happening. I got colder. I started with a green drake, just because. I didn’t have a look. 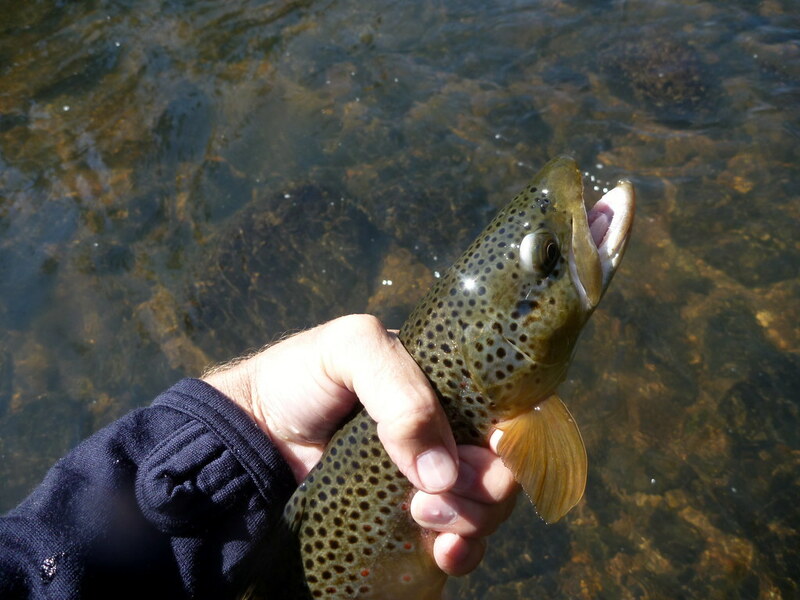 As the air temperature rose a bit, grey drakes starting coming off along with some caddis and a host of smaller stuff. Fish started rising. I switched to an extended body paradrake and started to catch a few fish. Good times. I kept working my way upstream, not able to work all of the river due to the mix of currents and non-wadeable water (at least for this wet-wading, old guy). But every place I could work and expected fish, there were fish willing to look up. From that perspective it was like working one of the backcountry streams. In one, particularly exceptional run I got so I could predict the rise based on the water and structure. I was seldom disappointed. 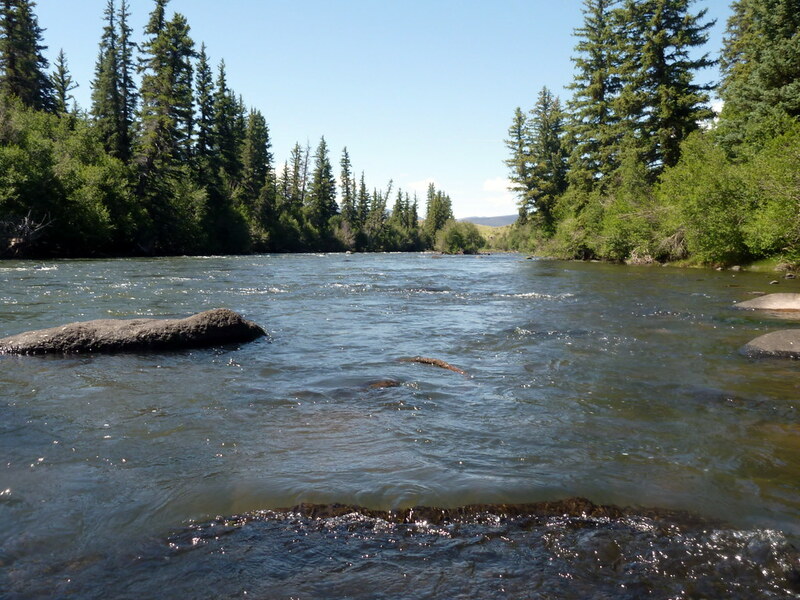 Some say that fishing a big river isn’t any different than fishing a bunch of small streams all at once. I don’t think I can agree with that. 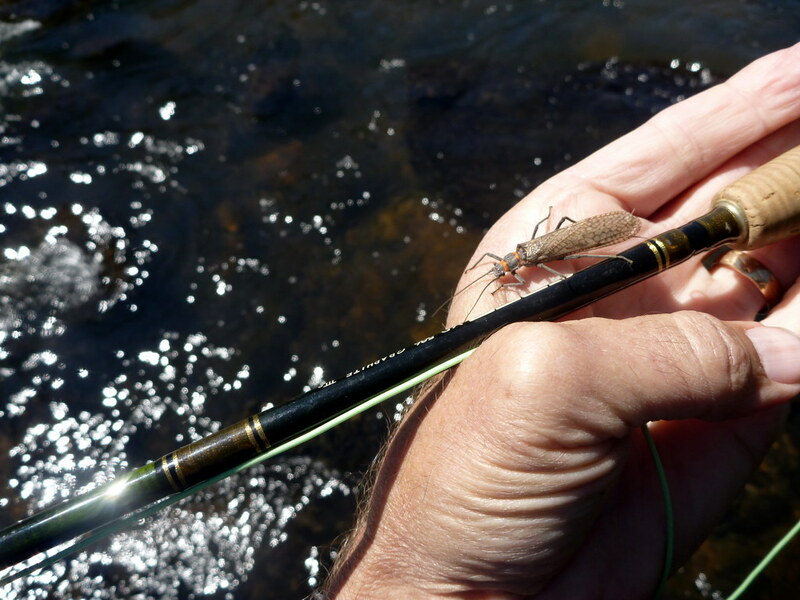 I fish small waters for many reasons but one is that frankly, they don't require a lot of skill--which I don't have. Big rivers require more skill. It took me quite a while to rework some long unused skills and to develop some new skills to wade in the deeper stronger currents, to mend the line in conflicting currents, to fight and land fish in the hard water. 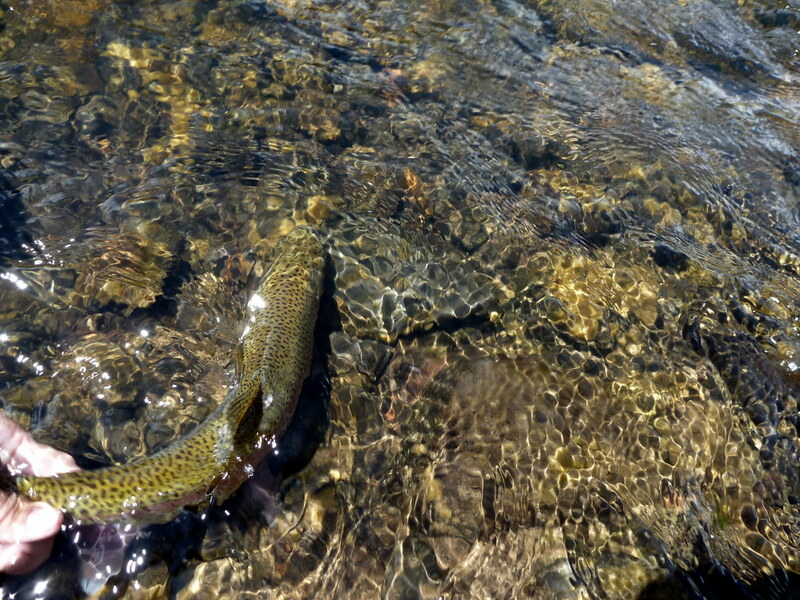 The bonus were that the fish were not just river fish, they were running larger than average this year. Most of the fish I caught were in the 14-16 inch size and stocky. I caught a couple up to 18 inches and (naturally, hooked and lost a couple of others that were (fill in the blank) inches long. I fished the exceptional run again, in the evening and again caught fish where and when I expected to catch fish. 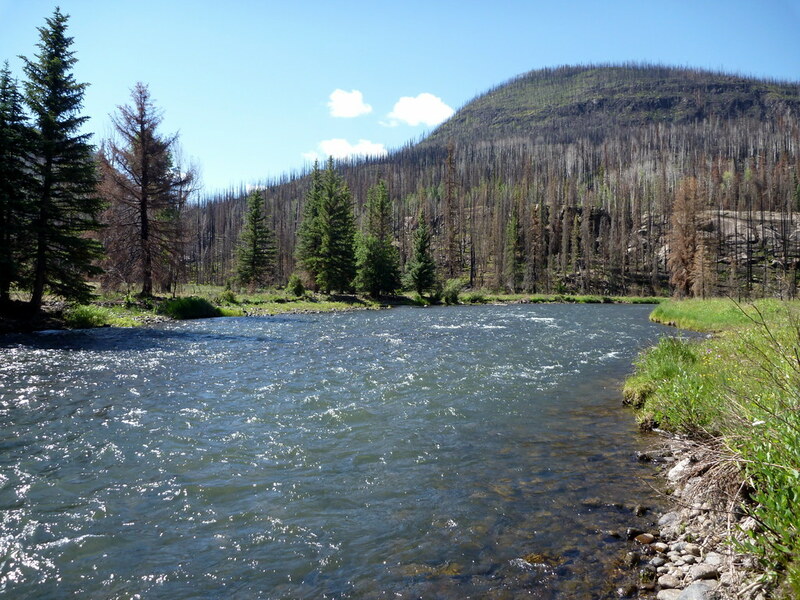 The next day, I decided to go quite a bit further upstream, maybe I could get in on a late salmon fly hatch or at least get to even more insect activity. I was greedy at this point. Carol went along to read a book along the river bank and see the result of the fire. Upstream is a bit of a problem. It is where most of the public water is along with 3 campgrounds and two resorts. We started earlier because there could be a bunch of fisherfolks up there and there were. I finally found a small section of river devoid of fisher folk and started fishing with the extended body paradrake dry. Here, I started in a long riffle. I didn’t get any looks in the riffle itself but was able to pick up a couple from some of the quiet eddies along the side. Unfortunately, I was within sight of the road at the time and as I caught the second or third nice fish I looked around to see a pickup watching. I waved and moved on up around the bend to some of the most beautiful water I’ve ever seen. Oh, this run is going to haunt me for a long time. By this time of the morning, bugs were starting to pop. The run was deep water with current and a number of large rocks space all through the 50 yards or so of the run. In front of each rock there were one or two large fish rising with abandon. The pool was too deep to wet wade to the other side without going back to the riffle so I set my strategy based on one side. I caught half a dozen fish and hooked several more, but should have caught more.My lack of skills tuned to the larger river frustrated me as I put too many fish down on the far bank. I just couldn’t quite dial in the right cast with the right mend. I was conflicted. On one hand I was having a ball and on the other I was getting frustrated. At the head of the pool there was a very nice riffle dropping in from the side creating one of those perfect places to drop a dry--much easier than throwing all the way across two or three currents. Just cast out into the riffle and let the fly swing down to the fish waiting below. 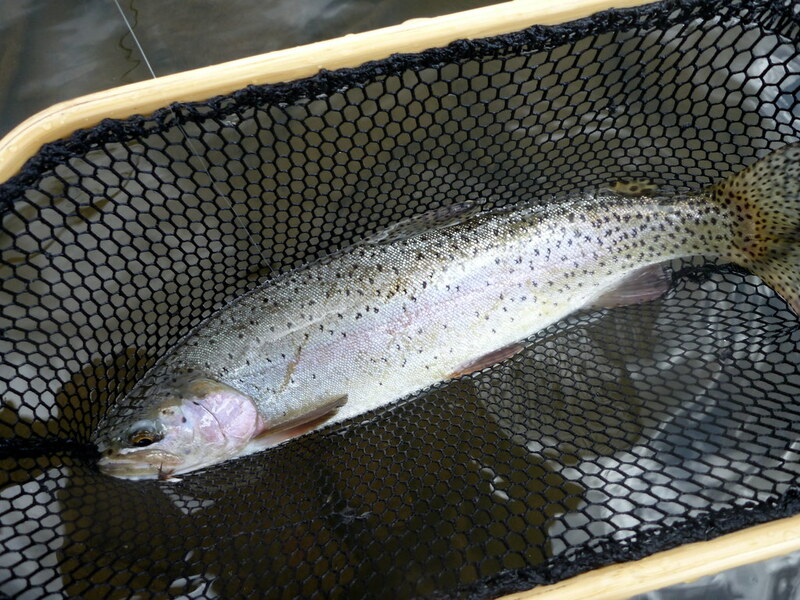 I picked up a nice rainbow and then thought I’d work my way back down stream, let the run rest and do it again. As I approached the guy from the pickup, I noticed he was wearing chest waders and could get to the far side pretty easily. I suggested he try that since there were a number of fish there that I had not thrown a fly to. Of course, he asked if it was ok to ask what fly I might be using if I don’t mind. He said he was throwing a caddis and not getting any hits. (Not a surprise, since the air was alive with grey drakes.) I’ve heard of folks that have refused this type of request but I’m not sure it is in me to refuse. It did grin inside a bit. I pulled out a box of the extended body flies and gave him one. He looked at me and asked if I were a guide. I laughed and said, you were right behind me, didn’t you see all the fish I put down? He said he only saw the fish I caught--different perspectives, I guess but I imagine that is the first and only time anyone will mistake me for a guide. 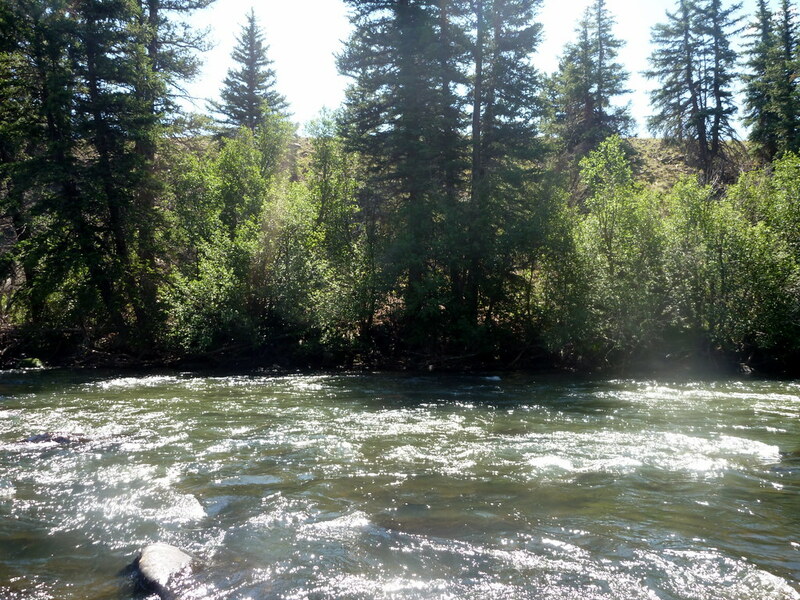 Naturally, I wanted to redeem myself and work on trying to actually do justice for the privilege of fishing to rising trout in such beautiful water. I went back an hour earlier the next day--hoping to get to beat the others to just that one run and wait for the bugs and the fish to wake-up. I got there early but there was already a flyfisher in the middle of the run--even though the fish weren’t rising, yet. Aggghhh. I decided to rig up and wait him out--let the run rest a bit. The fish weren’t active yet anyway. By the time I rigged up, I looked up and he had been joined by two others, in the same run fishing 10 yards apart. I guess everyone has their own way of fishing. I hope they were friends. They were there first. It is a problem that comes with fishing public water, next to the road and between campgrounds and resorts. I guess I’ll have to wait another ten years for the next epic hatch to redeem myself on this run. The Big River had tempted me by favoring me with some epic hatches and fishing but of course it couldn’t last. The next day I went back to my first love---the small backcountry streams where the fish are smaller but just as eager and more importantly--no other fisher folks. I did try the big river one more time in the late evening, downstream from town about 7 miles. I knew the big hatches were over down there but thought I might get in on one of the unpredictable late evening caddis hatches. I was by myself on this run where my buddy Randy had caught a very nice rainbow on a similar evening the year before. True to form, the clouds broke as the sun set, lighting the runs and riffles in brilliance against the dark background of the firs and spruces on the opposite side of the canyon. Every flying insect would be highlighted in the brilliant light. Just like the final scene in <em>The Movie</em>---except in this case I did not see a single caddis or other adult insect. I did coax two little browns to the top but it was obvious the main event was long over. I’m heading back out, this weekend for the fishing I truly love in the backcountry. But you know, next year I may have to schedule a trip before the fourth of July and see if the Big River wants to play the part of the temptress again. Ahh... the temptation would be too much for me too, nice getaway. the big river has its magic and it is a magic that cant be denied. Half my time always goes to the grandest of em all.